Lou Diamond Phillips plays legendary 1950s rocker Ritchie Valens (born Ricardo Valenzuela), in this musical biography. Before scoring radio and concert success with hits like La Bamba, C'mon Let's Go, and Donna, Valens was a 15-year-old migrant worker who worked with his mother Connie (Rosana De Soto). Valens' half-brother Bob Morales (Esai Morales) is a vitriolic ex-con who roars into the migrant camp on his Harley after his release from jail. Valens' musical talents are encouraged by his family -- though later various members of his family react to his fame with varying degrees of pride and envy -- and he soon earns an audition with legendary record producer and former Artie Shaw clarinet player Bob Keane (Joe Pantoliano). Valens soon appears in an Alan Freed rock n' roll teen exploitation film, lip-synching his blistering recorded version of Ooh, My Head. When a romance with Donna Ludwig (Danielle von Zerneck) is forbidden by her conservative father, Valens pens the famous ballad that bears her name. Tours follow his chart success until the fatal plane crash that claimed the lives of Valens, The Big Bopper (aka J.P. Richardson), and Buddy Holly on February 3rd, 1959. The supporting cast is excellent with power-pop icon Marshall Crenshaw playing Buddy Holly singing Crying, Waiting, Hoping. Brian Setzer accurately portrays rocker Eddie Cochran, and Howard Hunstberry plays Jackie Wilson and sings Lonely Teardrops. Additional music is provided by Los Lobos, a band who traces their musical roots directly to Valens and other Mexican influences. Also making cameo appearances are the real-life Mrs. Connie Valenzuela and Bob Morales. 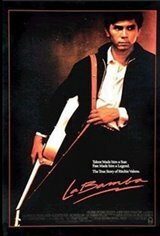 Although not 100% historically accurate, La Bamba is much more accurate than 1978s The Buddy Holly Story. The feature turned a new generation on to the influential Tex-Mex rock that was an inspiration to such later rockers as The Bobby Fuller Four as well as Los Lobos.